Oh boy, is my tail just a waggin'! School is back in and I get to go with Grandma to pick up the girls from school most everyday. I love to go help pick up the girls. I get to people watch while we wait for them to come out of the school. Also, Grandma got a new puppy! 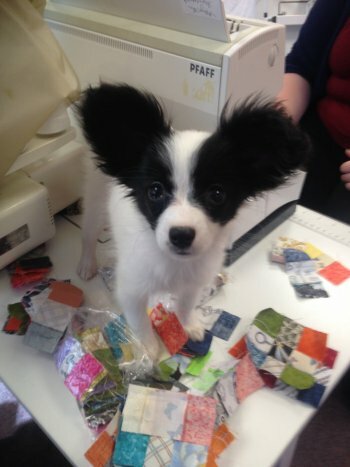 Her name is Moda and she is a Papillon. I think she looks like a hairy albino bat, myself. She is very cute with very big ears. 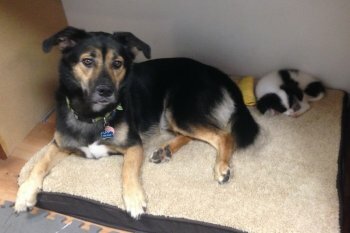 Moda is my new puppy, too! It's my job to look after her while she's in the Shop and to show her what the back yard is for. Moda tries to be helpful. Sometimes, she does a pretty good job at being helpful. But I'm still the big dog at the Shop. Now back to other happenings around the Shop and area. 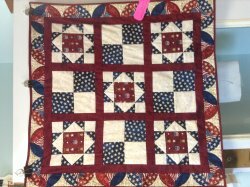 Don't forget the Endless Mountains Quilt Guild Quilt Show is September 24-25th at the Lynch-Bustin School in Athens, PA. Admission is $5.00. We will be at the Quilt Show and also open both Saturday and Sunday of the Quilt Show. We are just up the road a little ways from the school. Here in the Shop we are ready with our new Fall fabrics and our Christmas/Winter fabrics have come in, too. 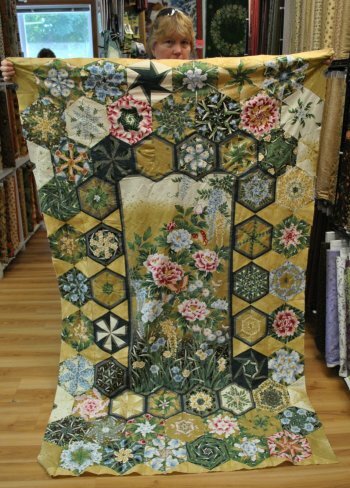 We will be having some unadvertised Quilt Show Specials in the Shop Sept. 23-24th. Sat. 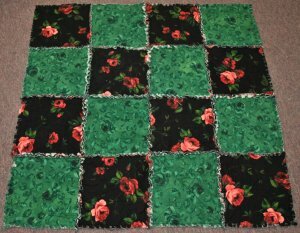 September 10th--Free Pattern & Demo Day Stop in for a free pattern and quick demo of how to make the block. 10a-11a Free Refreshments and door prizes. We hope to see you at our up coming classes. They will be lots of fun. We ask that your register for your class beforehand. Except for this Saturday's Class. I'm sorry that one is short notice but there is still room in the class. You may either bring your own fabrics or purchase your fabrics at the Shop. If you purchase fabrics for your class at the time of registration, you will get 10% Off your class fabrics. This month we have a little quilt show for you. 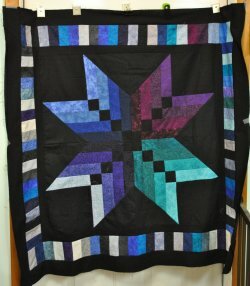 This One Block Wonder was made by Pat Holmstorm. 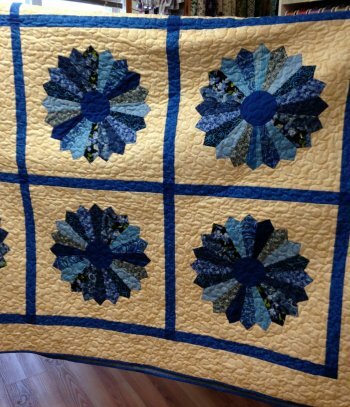 The center panel is the fabric she used for her One Block Wonder. We thought using a panel was a fabulous idea! For September, we are going to do another Fabric Challenge. This time with bigger swatches of fabric and a twist. The Fabric Challenge this time is to take the 2 swatches of fabric we give you and add up to 4 additional fabrics of your choice to make a table runner. We would like to donate the table runners you make for the Fabric Challenge to local nursing homes to brighten their dining rooms for the residents. As always, it free to join in and we suggest that the table runners be around 10-14" wide by 18-24" long. We will have customer voting to determine 1st, 2nd, 3rd place winners who will receive a prize and all table runners in the Challenge will be donated to the local nursing homes. 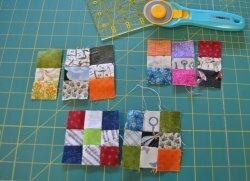 Participating in the Fabric Challenge is a great way to try working with some new colors and designs you may not necessarily normally work with. It helps get the creative juices moving. Just in time for cooler quilting weather. You may pick up your swatches of fabrics between Tuesday, September 6- Tuesday September 13th. Table runners will need to be turned in by November 5, 2016. Customer voting will be Monday, November 7- Monday, November 14, 2016. Winners will be announced Tuesday, November 15, 2016. We hope to see many of you participate in our Fabric Challenge! Well, I think I've covered everything for September. 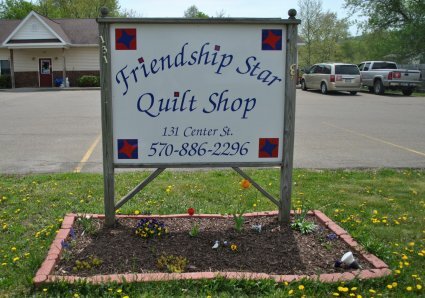 We hope everyone has a had a wonderful Summer and are getting ready to start quilting now that the evenings are getting shorter and cooler. I, for one, being part Husky and Corgi is more than ready for cooler weather. I have spent most of the Summer laying on the cool tiles in the foyer and staying in the air conditioning. I made Mom & Grandma remove the big rug in the foyer so I could have a cool place to lay down on & they have to turn my little fan on in the office, too. I like to lay in front of my little fan. Mom & Grandma will see you at the Quilt Show at the end of September and I will see you at the Shop during the Quilt Show. Mom says dogs are not allowed in the school and I don't need to be near the quilts, either. Mom did say I'm big enough to go to the Shop, though. Hooray! Last time I was too little to be at the Shop when it gets really busy. She was afraid I would go home with someone I wasn't suppose to.